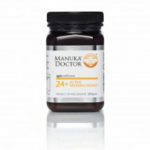 A larger jar of Manuka Doctor Active Manuka Honey 24+ to make sure you don't run out! Manuka honey is special for a good reason - its a totally natural product and is made by hardworking bees in New Zealand. A scrumptious manuka honey from Manuka Doctor. Each batch of honey can be traced back to its source. Delicious and natural gift of nature.